Ruthiebear (Titusville, NJ, United States) on 22 May 2018 in Lifestyle & Culture. I do not believe that ad. Un sacré bac à haricots vert quelle image et captage superbe. La canneberge est pleine de bienfaits. Je n'en trouve pas de fraîches par ici. Ha ha, Happy ST Ruthie! Oupsss hihihi les cranberries ont changé de couleur hihihi... belle prise! Bise, bon mardi tout en douceur! There's definitely been a transformation overnight! Happy ST! Petite erreur dans la pub ? Vraiment drôle cette photo ! A good silly Tuesday picture I didn't recognize. 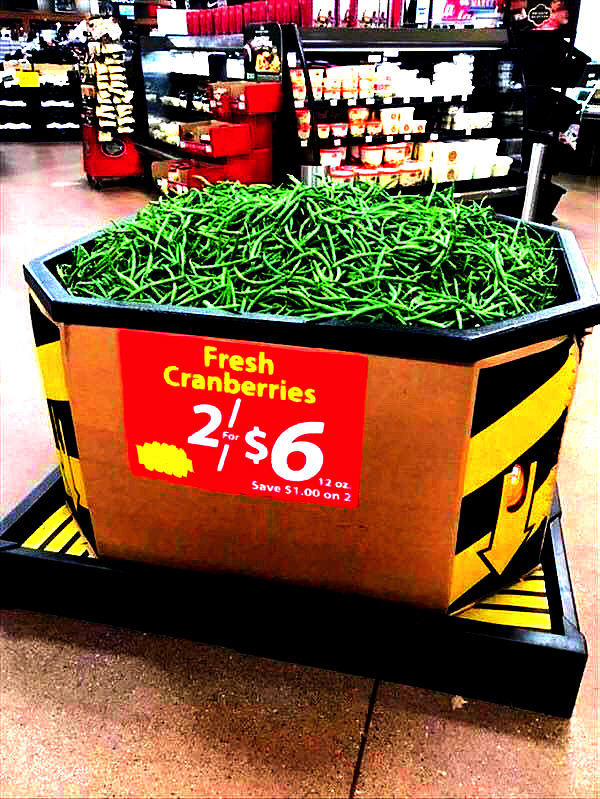 :) Are string beans also kinown as cranberries ? they didn't take the time to change the label! Cranberries ...? Green beans rather ! Well... They have turned green... Very funny! Well seen and a superb green for the cranberries ...Happy ST ! Si dans les magasins on se met à confondre les airelles et les haricots verts ... C'est qu'il y a un problème !!! Merci pour le partage ! Those are the strangest cranberries I have ever seen! Happy ST! It takes a master salesman to sell those long thin green strawberries. Especially at $3 apiece. This is too funny!! Great blooper type photo.